How far does your dollar go? 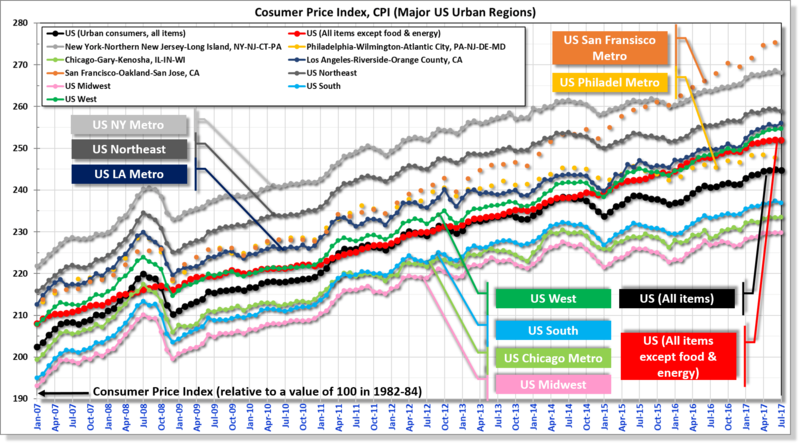 Consumer Price Index (or cost-of-living index or inflation) over time in top US regions (2007-2017). Consumer Price Index, CPI is a measure of the average change over time in the prices paid by urban consumers for a market basket of consumer goods and services. This index is used by governments and major institutions to decide on pension payment, tax changes, social security payments, and other major policy decisions. In short, CPI is a measure of how much a dollar can buy over time. Key learning: (1) the CPI (all items) and CPI (excluding food and energy) started to separate at the end of 2014 as the home & rent prices increase; (2) This is specifically true for San Francisco/San Jose Metro where the prices are increasing at a much faster rate; (3) East coast & West coast show higher price increases while Midwest & South have lower price change, making these regions much more affordable. NY and San Francisco are top metros for price increases; (4) the only time when prices reduced was 2nd half of 2008, during the start of recession. Source: Bureau of Labor Statistics.